Thomas Ruth A330-200. Full aircraft, repainted in Platinum Airways' new livery by Al Nel, auto-installer by Vic Ayres. Platinum Airways is the Open Skies VA that allows its pilots to fly the mission of their choice with the aircraft of their choice at the time of their choice. Screenshot of Platinum Airways Airbus A330-200 in flight. 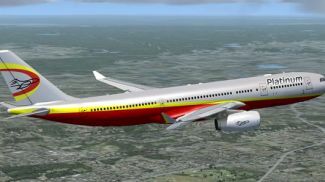 The archive pt_a330-200_fsx.zip has 5 files and directories contained within it.